bravo! the perfect book to send. i wonder if any of them have ever read it (doubtful). Great idea. FLAWS: 1) Who would read to to each member? 2)Who would explain what the reading means? 3)Now really, who among ‘them’ would you imagine would have the moral crust to go against ‘the agenda’? ‘They’ need to understand what it might feel like with a boot on their respective throats. Cynical? Perhaps; just another parent, NAM combat vet, deeply frustrated. Rob @ Saint Pete, FL..
Great concept, but better that we organize to force these craven scum out of office in November. We must impeach Bush, Cheney & Co., and restore the Constitution. Perhaps a march on Washington by hundreds, or better yet, thousands of citizens brandishing copies of 1984 would be more effective. The Faux News people wouldn’t be able to spin that one in their favor. I’m ready. Quite a ministry you’ve got going on, I’m not sure what the deal is with it, but seems like you’ve made some good progress. Just ordered 5 copies of 1984 for your collection. Please be sure at least one goes to the brave John McCain R/AR who stood up to the president in order to stand down. I think this idea has stuck a cord. You may well blessed with an over abundence. I hope so. I think this is a class action. You may find you are being swamped by copies of the book, it was on every high school reading list for years, after all. I thing you might find you could use the help of a liberarian. A school liberian would would be perfect, or really a former one who still maintains an interest in promoting reading. would be ideal. I have just the person in mind. How about sending excess copies to Laura Bush for distribution to schools ? No need to ask, just send them , of course she will help. What libarian wouldn’t? Any copies in excess of 315 will be shipped to our Glorious Leader and His Wife. When Protentantism shall stretch her hand across the gulf to grasp the hand of the Roman power, when she shall reach over the abyss to clasp hands with spiritualism, when under the influence of this threefold union, our country shall repudiate every principle of its Constitution as a Protestant and republican government and shall make provision for the propagation of papal falsehoods and delusions, then we may know that the time has come for the marvellous working of Satan and that the end is near. Testimonies for the Church, 451, (1885) Ellen G. White. Comrades, I found a post by O’brien quite interesting and decided to examine the site mentioned on the comment left. I agree with your endeavour 100 per cent. However, these legislators also need a book by a prophet who expired in 1915, Ellen G. White, “The Great Controversy”. The quote above by EGW is only “the tip of the iceberg”, awaiting us, if we stay the course. Bravo! 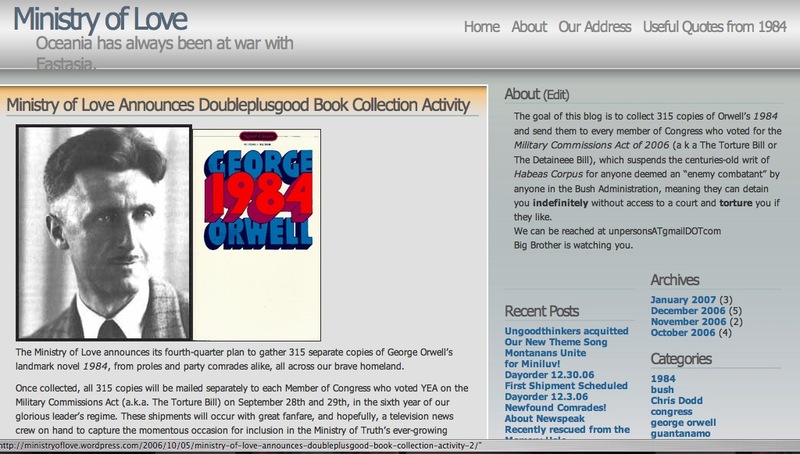 For more on the rapid slide into an Orwellian utopia, take a look at: http://jtoddring.blogspot.com. Thanks for the comment, I will see if I can rustle up some books for you – what a great idea! This idea is pure win. The sad truth is that those in Congress may not be the readers we would hope they should be. Most of them grew up during the glorious era of ubiquitous telescreens (the nineteen fifties), thus are more apt at to take notice of the fleeting image on the cathode ray tube which served as electronic wetnurse during their formative years. A survey of them may reveal that 1.) they may have heard of George Orwell; but 2.) Unfortunately, “1984” was not on their high school required readng list; or 3.) Perhaps it was required reading but somehow they evaded that requirement and still maanged to read the Cliff Notes enough to graduate. Hence, methinks the better proposal is to gather the necessary number of DVD’s of the 1984 version of “Nineteen Eighty-Four” to send to these pompous windbags, blowhards, knaves and fools to watch on their telescreens. Afterall, “the play’s the thing wherein we’ll capture the conscience of the king” (and his Congressional entourage of yes-men). Alas, I’m afraid our King Dubya has no conscience to capture. And the point of the bok would be lost on him and his junta. I do admire your tenacity and determination. As an act of conceptual art your project is brilliant. How about this thoghtful compromise? Before ending any books to any of them. Send each – by registered mail – an officious-looking parchment scroll, (all pomp ‘n decorum, y’know, they’ll think they’ve been awarded something they can put on their office wall). In Old English calligraphy, make them the offer they can choose: either a copy of the book “1984” (for those who still are willing to read) OR a copy of the DVD “1984” (for the telescreen generation and/or attention-deficit). In this way, you’ll save yourself the trouble of actually wasting copies on those who’ll never read them. And, you’ll only be out 63¢ for the postage, and a few bucks for photocopying the parchment proclamations. I’ll even donate the tubes for mailing the scrolls. This way, you will have made them the offer, giving them the freedom (they love to bandy about that word, don’t they?) to choose. More importantly, you will have results worthy of wide dissemination. Reporting just how many even reply to your most generous offer will, in and of itself, be quite newsworthy. Of interest, too, would be how many choose the book or the DVD. I’d reckon a one percent response rate would be surprising. In direct mail appeals, one percent is said to be a “good response rate to a targeted audience. 3% is considered highly successful. Contact the esteemed author Sarah Vowell about your project. As an American history afficianado, she is someone who would truly undersand and appreciate the public service value and merit of your project. She’d also be charmed and inspired by the innate insidious humor underlying the whole concept. With her quick wit, know-how and connections, she could help you in ways one can’t even imagine. Even better than having Oprah and Martha Stewart on your team. At least she might write back (unlike self-infatuated mega-celebs O. & M.) Read Sarah’s books “The Partly Cloudy Patriot” and “Assassination Nation” for a taste of her insightful and inciteful take on life in century 21 America. I’ll loan you the book-on-tape version, being too busy myself to actually read. P.S. – Today is the 63rd anniversary of the beheading of Sophie Magdelena Scholl, age 22, a student at the University of Munich, for the thoughtcrime of putting anti-Nazi leaflet publicly in the atrium of the university. She was turned in on February 18, 1943 by an observant and patriotic janitor, along with her brother, Hans and friend, Christoph Probst. After four days of interrigation by the Gestapo and the Reich’s SS, a kangeroo court show “trial” was held to publicly villify and condemn the students to death. They were led directly from the courtroom to the guillotine. The Big Brother of that era was so in fear of what these students, who called themselves The White Rose, might inspire against their all-powerful Third Reich, that they felt it necessary to immediately execute them to make an intimidating example of what becomes of those who defy the Party that had always been at war with Eurasia. Today we need a many more white rose movements worldwide. May a million white roses bloom. In reistance to tyranny today and tomorrow; in memory of their courage. Hi, I volunteered a little while ago to send a book to Sen. Stabenow (MI). I’m about to do that.. unless it’s been done already, in which case I can send a book to someone else, preferably from Michigan. Thanks! Great idea. Unfortunately, I doubt that very many of our elected representatives or their corporate masters would actually see the events depicted in ‘1984’ as necessarily bad things. We would probably end up seeing telescreens installed in every home by the end of the year. I do not think that enemy combatants, those who attack United States soldiers and citizens, OUR soldiers and citizens must I stress–need a trial to be detained. This idea, although well thought out, will ultimately fail because any knowledgeable politician understands this, and therefore would work to fight against it. Perhaps you should research more into this act before throwing out radical ideas. My President told me he’s supporting the truups. My president told me he needs military tribunals to support the truups. My president told me habeas corpus isn’t compatible with military tribunals. My president tol me habeas corpus isn’t compatible with supporting the truups.